Mumbai, June 26 (IANS) The Indian rupee hit another record low Wednesday and slipped the psychological resistance level of 60 against a dollar, due to high month-end demands for the US currency by importers and sustained outflow of money. The partially convertible rupee slumped to 60.63 against a dollar at the inter-bank foreign exchange market in Mumbai in the late afternoon session, surpassing its previous record low of 59.98 hit on June 20. 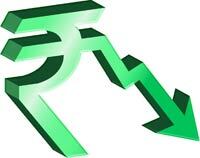 Rupee had closed at 59.67 against a dollar Tuesday. Analysts said the Indian currency would weaken further and may hit the 61-level soon. “If the market sustains above-60 levels on a closing basis then there is a possibility that it might hit the next technical key-level of 61,” said Abhishek Goenka, chief executive officer of India Forex Advisors. “We have witnessed huge outflows from the debt market in the current month which is putting severe pressure on the rupee. The prominent reason behind a massive outflow is the fading arbitrage opportunity for the foreign investors,” Goenka said.